After falling in love with the island two years ago, A and I decided to return to magical Mauritius this fall. After some particularly busy weeks and lots of rain we were in desperate need of some beach vibes and sunshine. 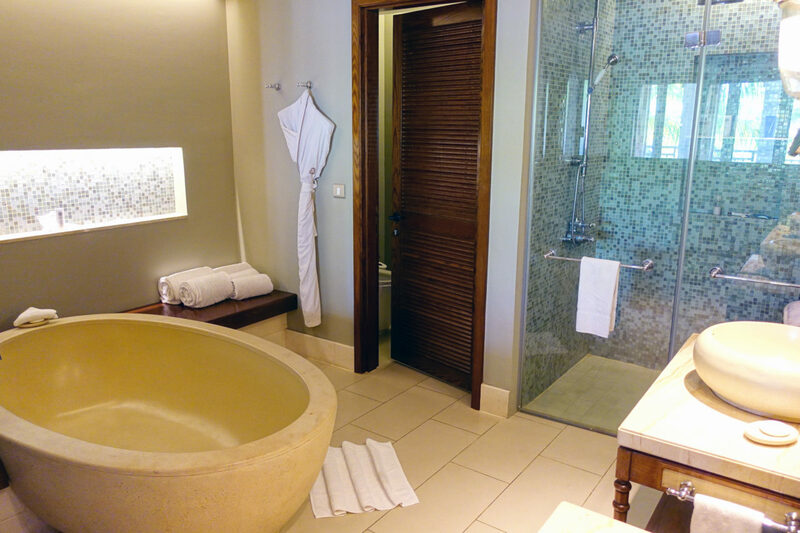 After experiencing a great first stay at The St. Regis Mauritius Resort during our first visit to the island, it was clear that this was the very best choice for our much deserved vacation. And what can I say guys? It was an amazing experience from start to finish. Continue reading to learn more about our fantastic stay. 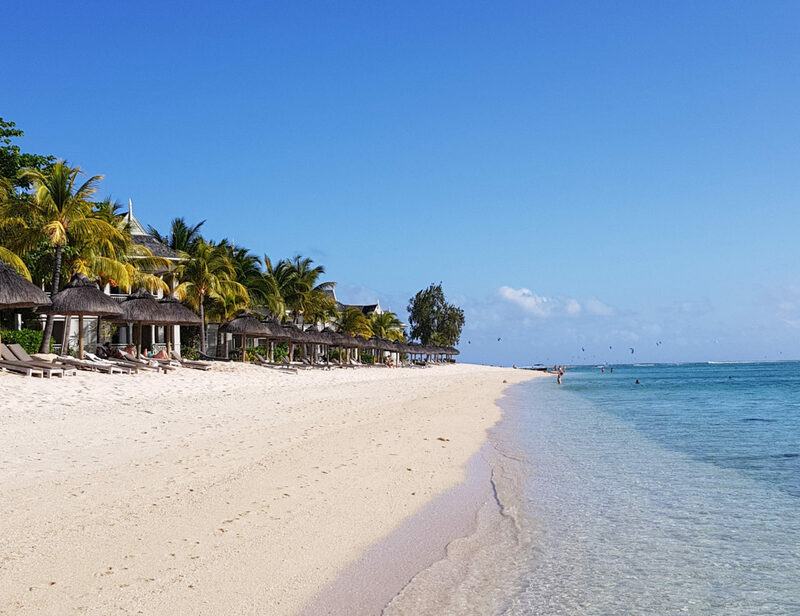 Located at the foot of the mighty Le Morne Brabant at the south-western tip of the island, the St. Regis Mauritius is the perfect beachfront resort. 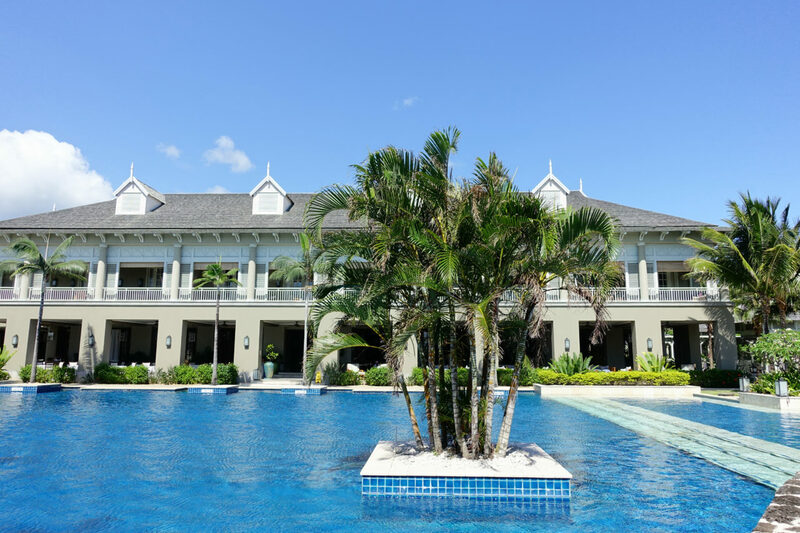 Located at a lagoon overlooking the crystal clear Indian Ocean and with its never ending white sand beach it is worth taking the one and a half hour trip from the Sir Seewoosagur Ramgoolam International Airport. A and I arrived on the island in the late afternoon after an easy seven hour flight from Dubai. The St. Regis arranged our taxi transfer. For us, it was more comfortable than driving ourselfs as road traffic on Mauritius can be tricky – been there, done that. After arriving at the hotel the friendly valet staff took care of our suitcases while we were escorted to the beautiful and airy reception area. Overlooking the resort and the ocean we were served a glass of bubbly and a short shoulder massage while going through the quick check-in procedures. We were then escorted to our beautiful Junior Suite by buggy – a service which is complimentary throughout your whole stay but we never used except for check-in and check-out. 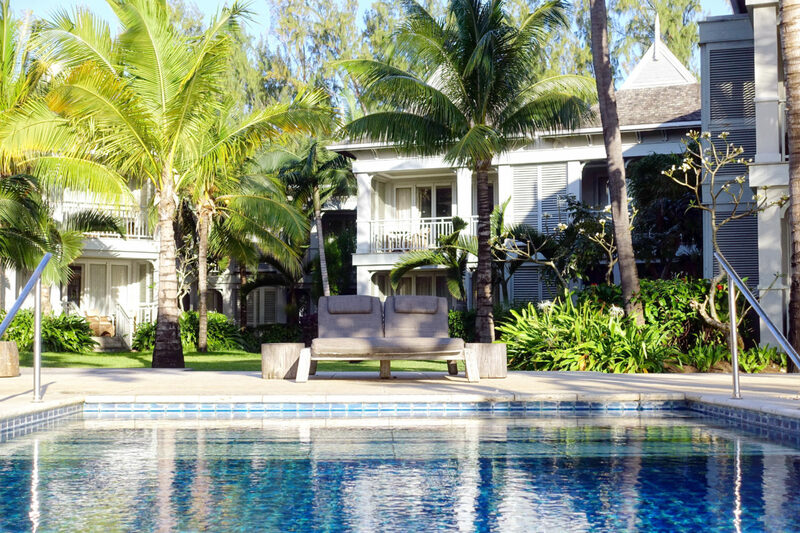 The St. Regis Mauritius is an all-suites resort and most rooms are allocated in two-storey clusters along the beach with ocean and/or tropical garden views. 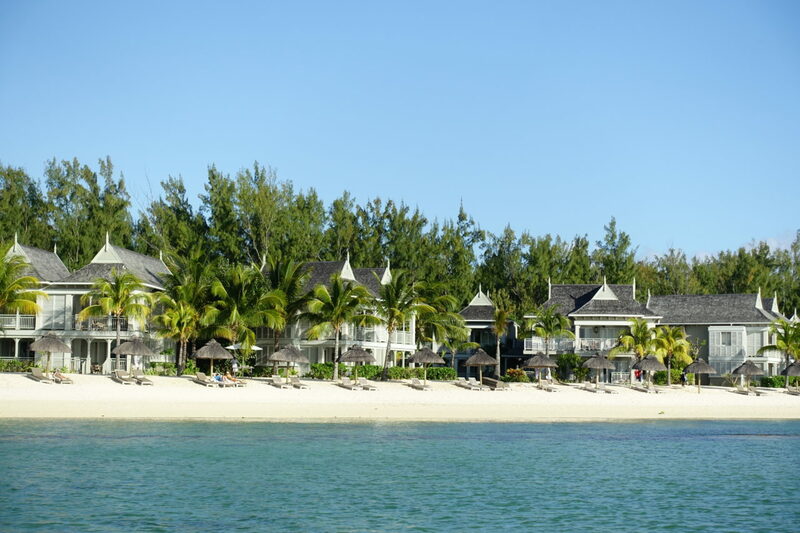 The St. Regis Mauritius is located at the foot of Le Morne Brabant. 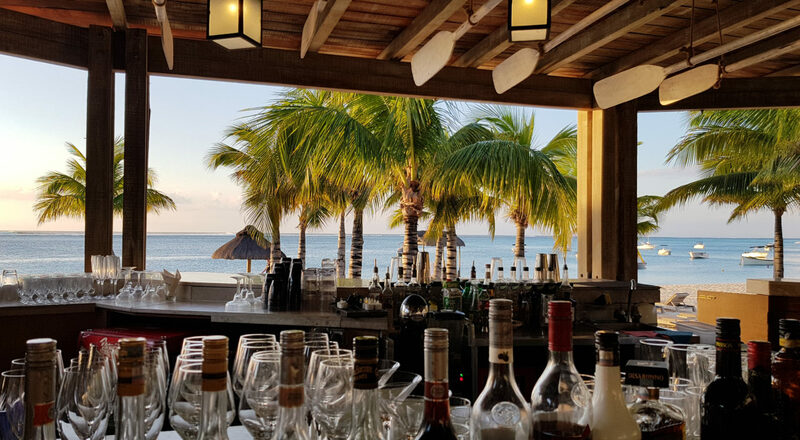 The view from the reception – What a way to kick-off your vacation. The resort feels airy with lots of colonial details. 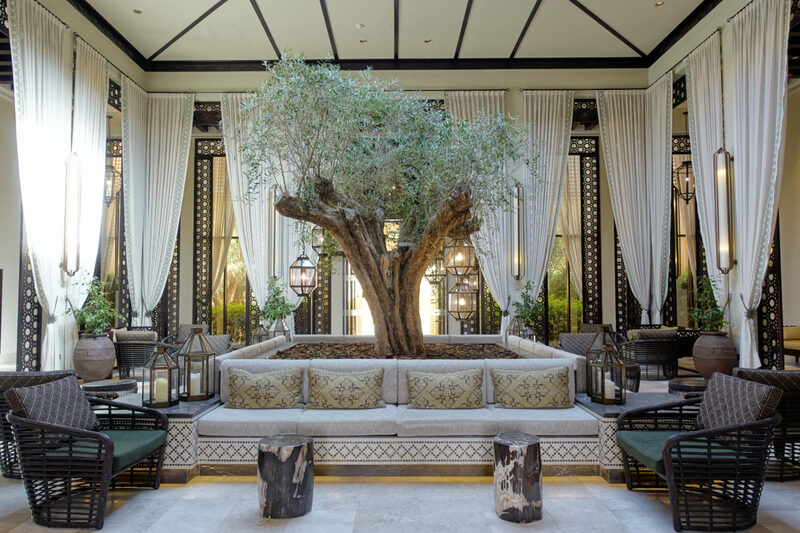 The public space of the hotel with its light colors and decor. You can find anything from a library to a cinema here. 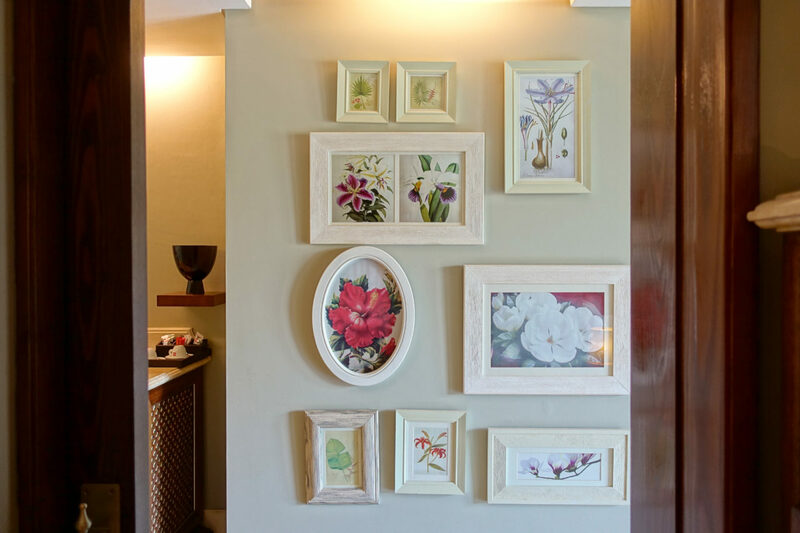 Our Junior Suite was located in the first floor and I loved it’s colonial and airy decor. The hallway was extremly spacious offering a mini bar area with an Illy coffee machine as well as a daily stack of complimentary water bottles. The room itself felt bright, decorated in white and taupe colors with some colonial elements in dark wood as welll as high ceilings. 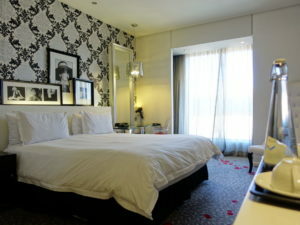 The huge king size bed was amazingly comfortable with crisp and luxurious linens and lots of pillows. Apart from the bed, the main room also offered a small couch, a nice light concept and plenty of storage room as well as well hidden TV (which we never used). 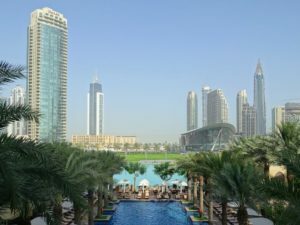 Our kingsize bed was beyond comfortable – I loved it! The decor was lovely with much attention to detail. 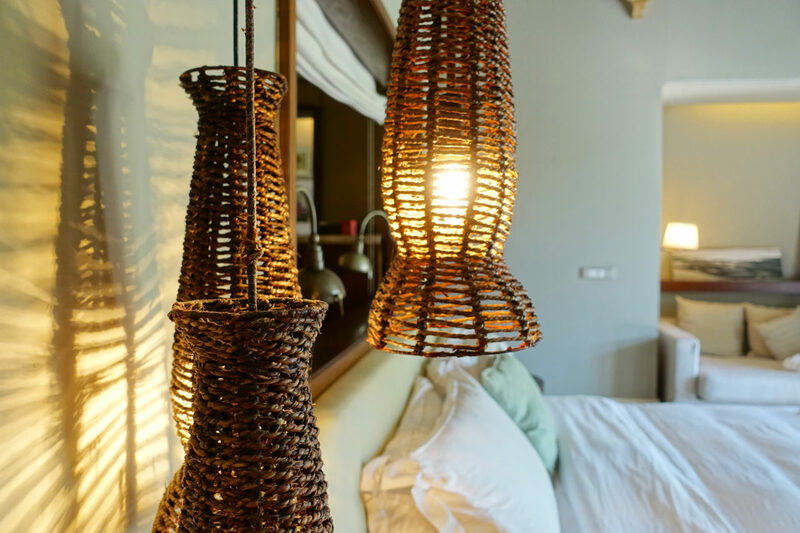 Lots of natural fabrics and a great light concept in our Junior Suite. 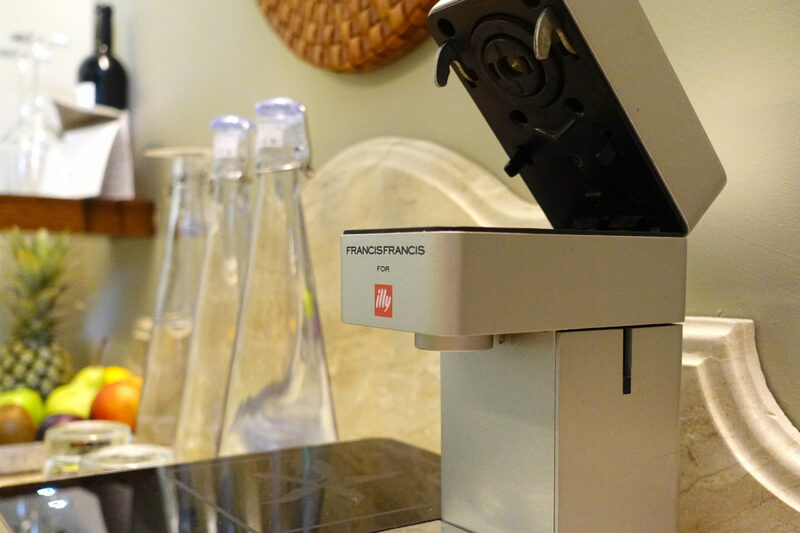 A is addicted to coffee – luckily there was an Espresso machine in the room. I especially loved the spacious bathroom area, with a double sink, a huge bathtub, a walk-in rain shower as well as separate toilet. Equipped with lots of towels and Remède amenties and attached to a big walk-in-closet as well as plently of drawers it rather felt like a private spa than just a bathroom. 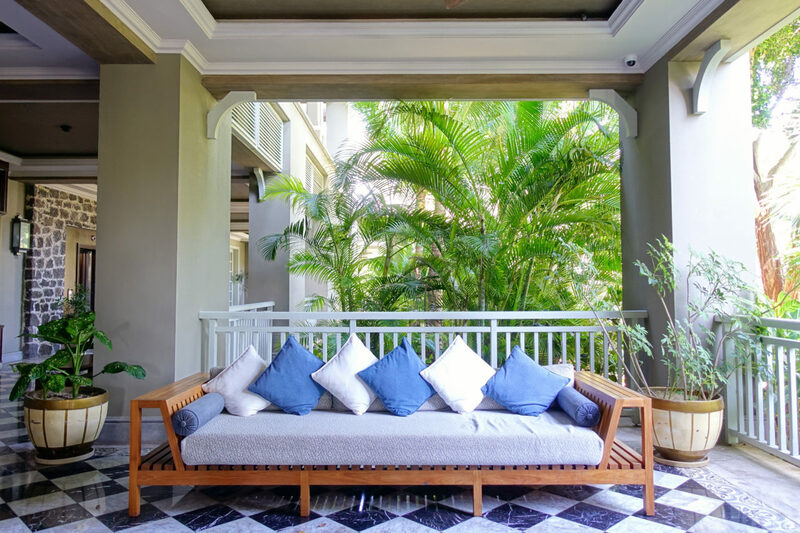 Our Junior Suite overlooked the tropical gardens with partial ocean views and featured a nice balcony with a small table and chairs as well as a lounge area. I liked that the wohle room concept was airy and worked with natural colors and materials but nevertheless felt luxurious. The bath felt like a private Spa and offered plenty of space. 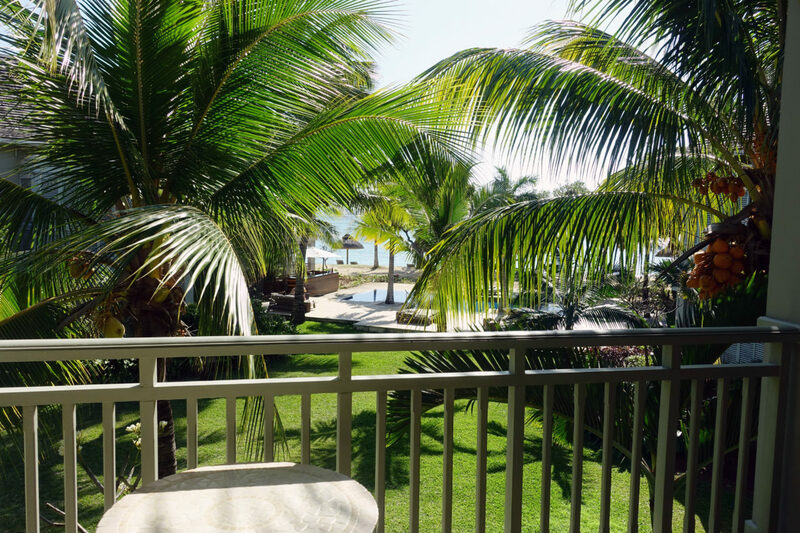 The view from our room – lush tropical gardens and a lot of privacy. 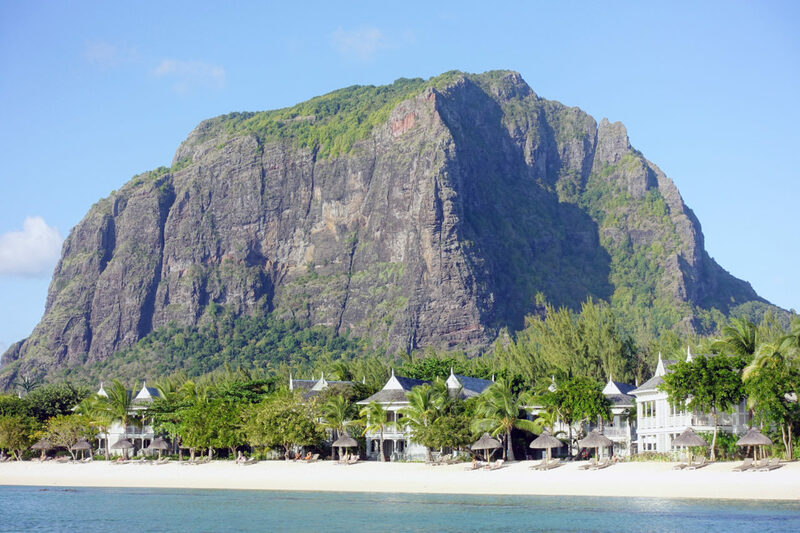 The resort’s location at Le Morne Beach is considered as one of the most beautiful spots of the island and I totally agree. The turquoise water of the Indian Ocean is crystal clear and the endless beach makes for breathtaking daylight views and even better sunsets. The resorts beach offers plenty of comfortable loungers and never feels crowded as there is more than enough space from one sunbed to another. Apart from the beach the property is also equipped with two outdoor pools – one huge main pool in front of the main building as well as a smaller quiet pool. We prefered the latter as it was closer to the beach and our room and offered a great bar area in the afternoon. All sunloungers at the beach are equipped with service buttons as well and waiters regulary pass by to offer the drink menu as well as complimentary sunglass cleaning or daily treat such as homemade crisps, fruit skewers or sorbets. Le Morne Beach is my definition of paradise. The main pool is huge – perfect for refreshing! The tranquility pool offers comfortable daybeds and lots of shade to relax. If you get fed up with just relaxing there are plenty of complimentary watersport activities offers on-site. We enjoyed snorkeling (you can see tons of colorful fish as the resort is surrounded by a coral reef), rented canoes and pedalo boats. Le Morne is also a world-famous kite-surf spot and it was great to see the pros giving their best on the ocean. You can also arrange for individual boat cruise with the watersports center. We used the opportunity and took a sunset cruise around the bay area. Not just one of the most romantic afternoons on the island (who can say no to a private cruise with crisp white wine and amazing views) but also a great opportunity to learn more about Mauritius as the skipper was friendly and knew everything there is to say about Mauritius. Our sunset cruise offered great views of the Le Morne bay and beyond. Being my second trip to Mauritius I must say that people on the island seem to be happier than elsewhere in the world. The team at The St. Regis Mauritius Resort is beyond friendly and always up for a chat without being intrusive and I loved that. Most of the staff is local and is happy to share more about the island its particularities. Similar to other St. Regis properties, the resort offers a Butler Service which takes care of any sort of request and is at your disposal day and night. From the complimentary pressing of your dress to dinner reservations – your personal Butler will take care of it in no time. If you don’t like to swing by the reception or call the Butler by phone and you are an SPG member, you can also contact the team via WhatsApp, which can be handy while on the beach. Even more easy, as the whole resort is equipped with complimentary WiFi, which worked smoothly in almost every corner. 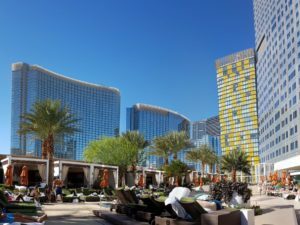 While we had some smaller hick-ups with the housekeeping and mini bar service during our stay, I still would say the service level at the resort is above average as the team managed to improve over time and handled the incidents in a very professional way. 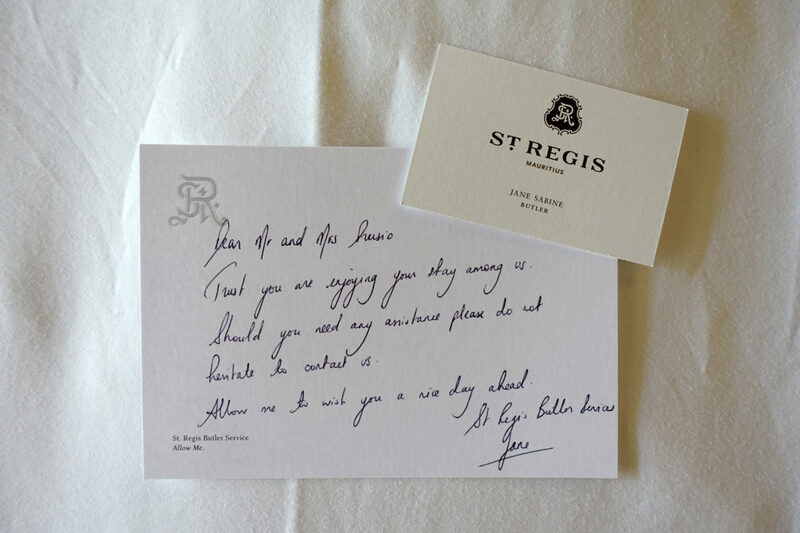 Our Butler Jane left lots of personal notes and took care of every detail. As many of you know, food is important to me and I love to try as many delicious dishes as possible while travelling. 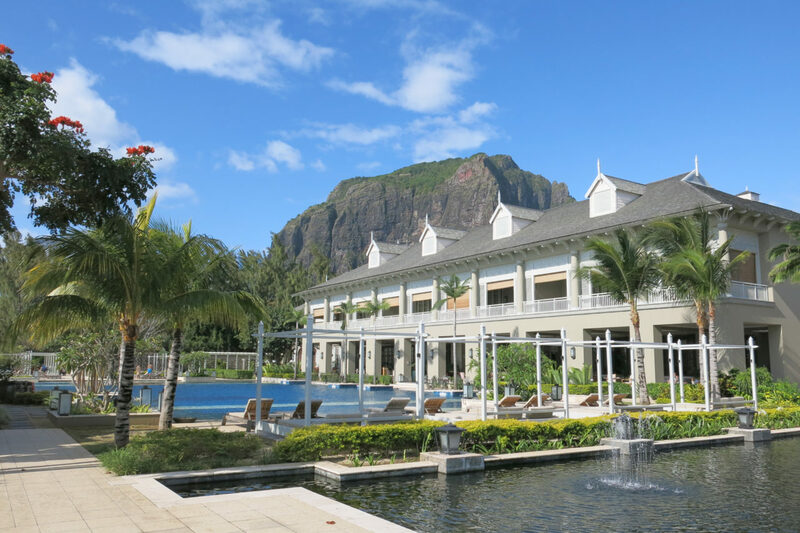 As the St. Regis Mauritius is a rather remote resort we opted for a full-board package for our stay and I can definitely recommend it or to at least book the half-board option. The resort offers five amazing restaurants on-site and we tried four of them. 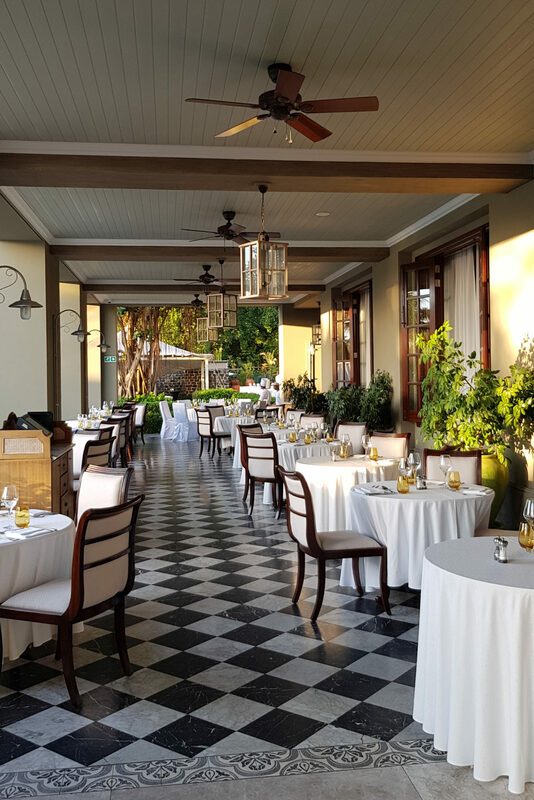 The main restaurant is called Le Manoir Dining Room and offers contemporary french cuisine mixed with local flavours and ingredients from Mauritius. While it is a la Carte for dinner most nights, there are some expections with theme nights and buffet service. It’s also the main breakfast restaurant with a wide buffet choice. 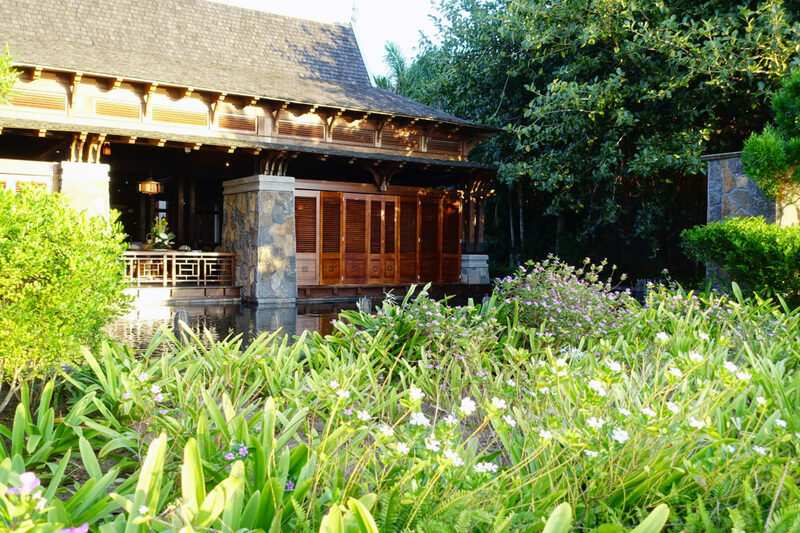 Le Manoir Dining Room mixes traditional Mauritian flavours with french cuisine. 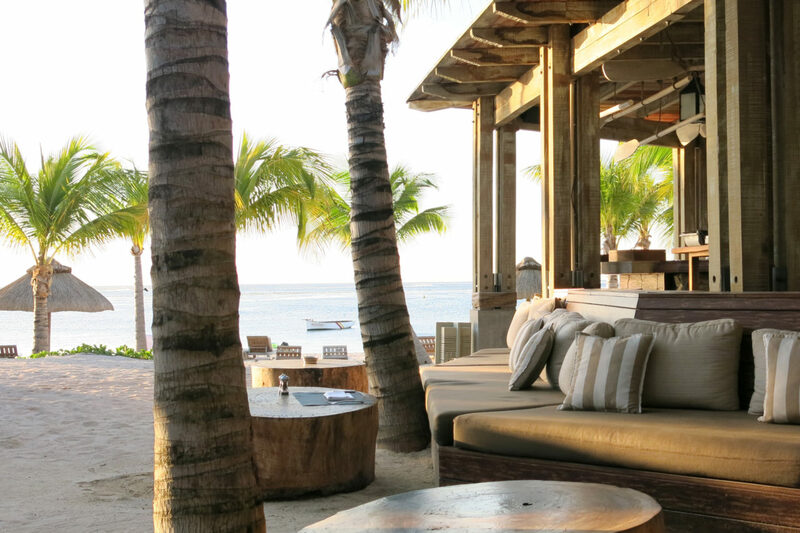 The Boathouse Bar & Grill – my favourite dining location on site due to his frontrow beach location. 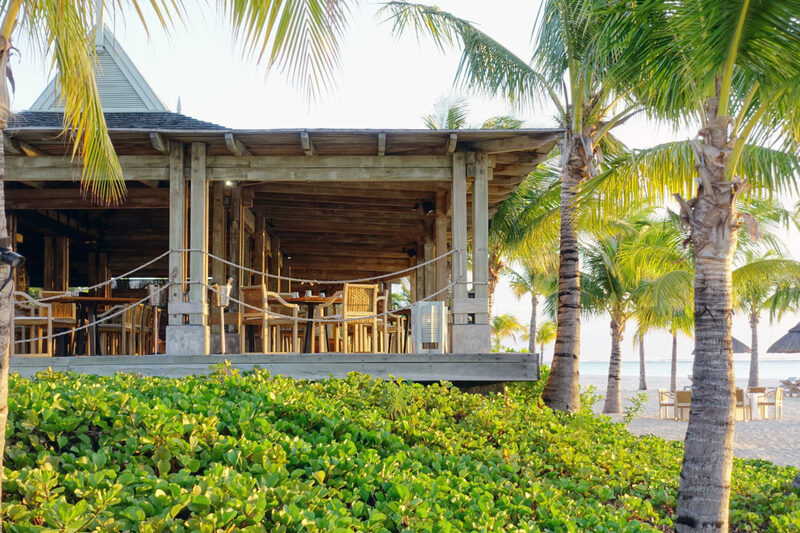 Right across from Le Manoir you can find the Beachhouse Bar & Grill, where daily lunch and and à la Carte dinner is served. 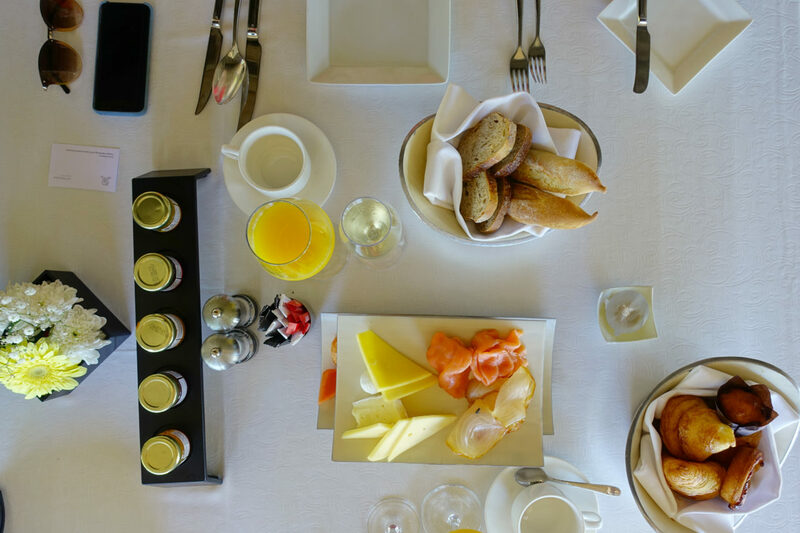 As SPG Platinum Member we also had the nice opportunity to kick-off our days with daily à la Carte breakfast there. With its great beachfront location and open air concept, the Beachhouse was definitely my favourite location. 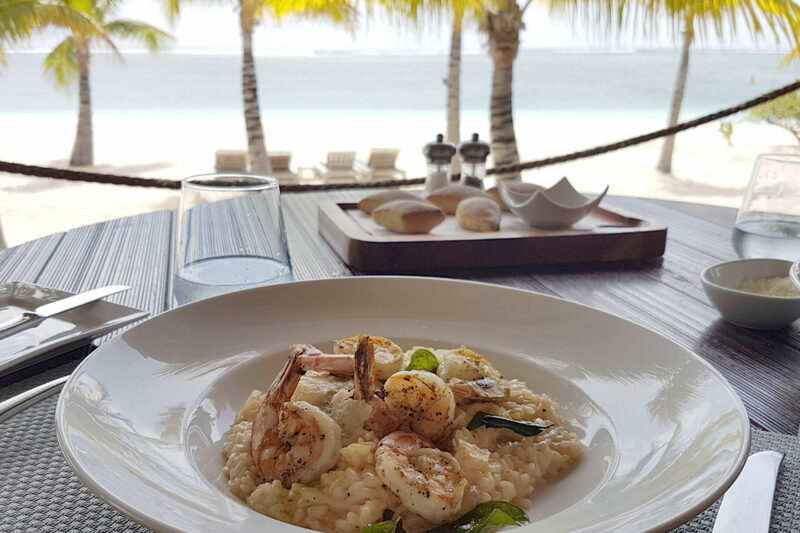 While lunch is either buffet (which was nothing to write home about) or a two-course à la Carte option (which was delicious), the dinner menu offers a variety of fresh seafood and fish dishes as well as high class meat options. A la Carte Breakfast is offered daily at The Boathouse Bar & Grill for SPG Platinum Members. Light and lovely – just the way I like my lunch by the beach. Additionally to these two dining options you can also choose from a romantic pan-asian restaurant called Floating Market as well as an Indian joint called Simply India and a Japanese haute cuisine restaurant called Atsuko (which we unfortunately didn’t try). All restaurants offer high quality cusine and we didn’t get bored as there where so many different options and tasty dishes. We also had the amazing opportunity to experience the Chef’s Table as well as an exclusive Mauritian live cooking event. Both were so fantastic that I decided to write a separate review about it, which you can find here. Not only the food but also the drinks were great. We tried many of the different cocktails from the Boathouse menu and loved to sit by the bar and watch the sunset. There is also a second bar (1904 bar), which offers the equal drink menu but lacks the prime beach front location. Nothing better than a sundowner by the beach. 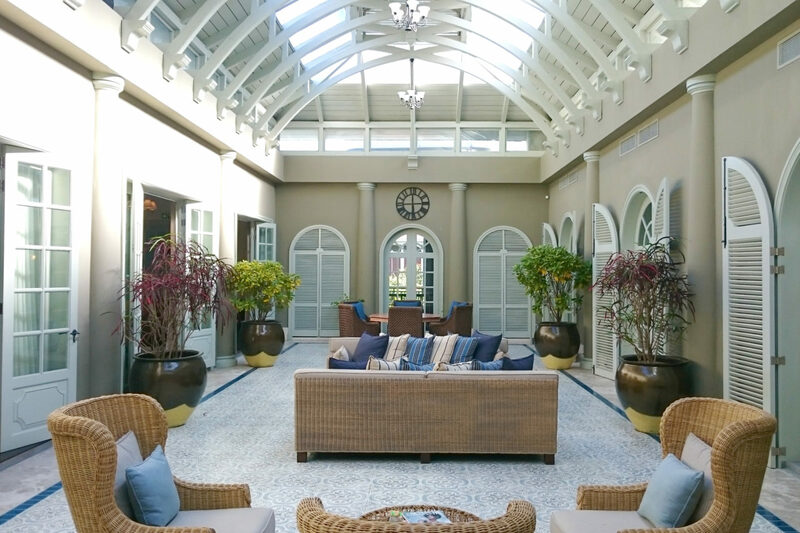 The St. Regis Mauritius Resort and Spa offers a wide range of Spa treatments. 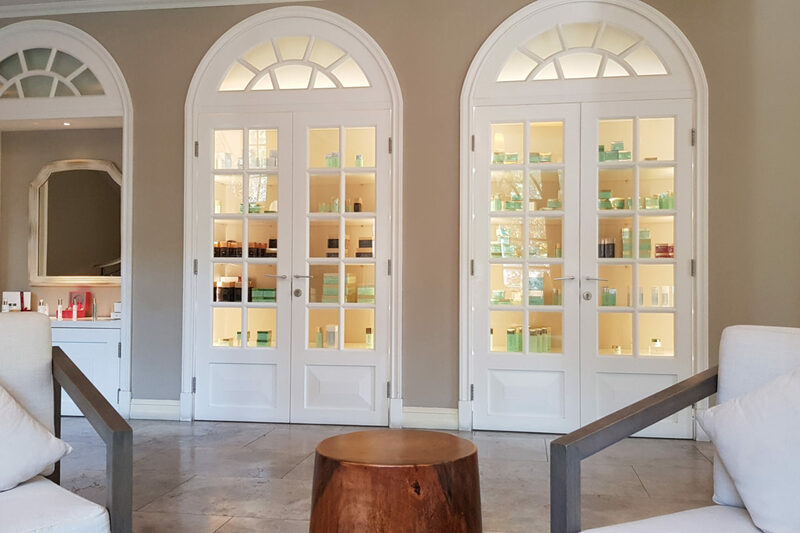 The Iridium Spa building itself feels modern and is equipped with luxurious treatment rooms. During our stay we were lucky to be invited to the “Morning Bliss” – their newest signature treatment. 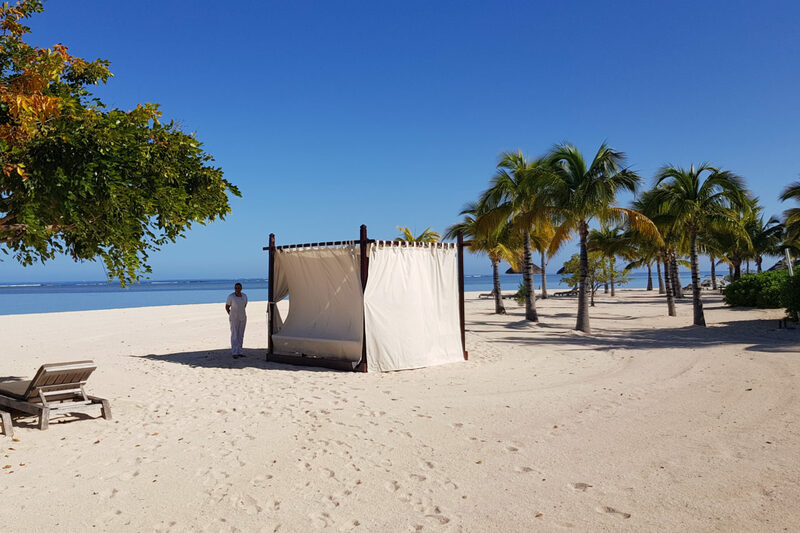 After being welcomed by our nice therapists, we were escorted to the beach where a treatment cabana with two massage beds was waiting for us. We enjoyed a 60 minutes side-by-side Detox Massage followed by an amazing breakfast at the beach. As the treatment was open air and in the early morning hours it was different from any other Spa treatment I’ve enjoyed so far. With no music but the sound of the ocean and the birds it was truly relaxing. Also, the private breakfast at the beach with our own waiter taking care of us and the wide range of out of the ordinary treats made for a morning to remember. 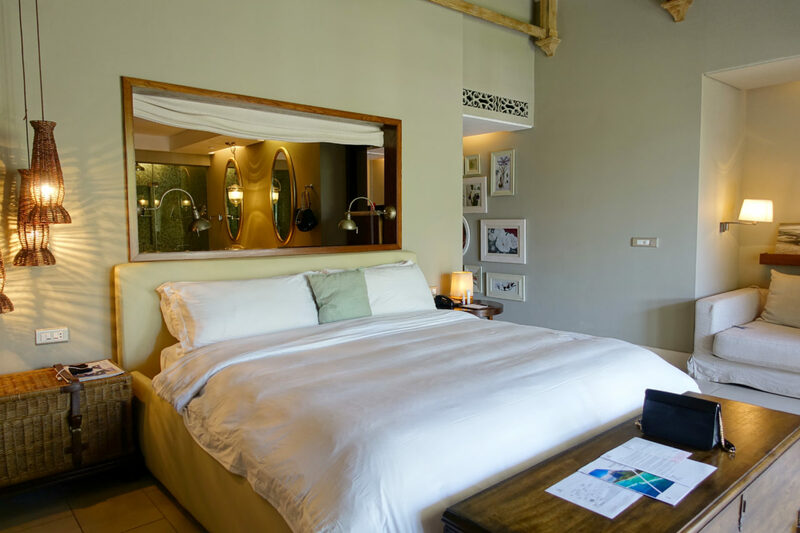 Even though it comes with a price tag I can highly recommend the experience to couples who want to step up their romance game as well as honeymooners and all other lovebirds. It will definitely set the tone for the rest of the day in paradise. 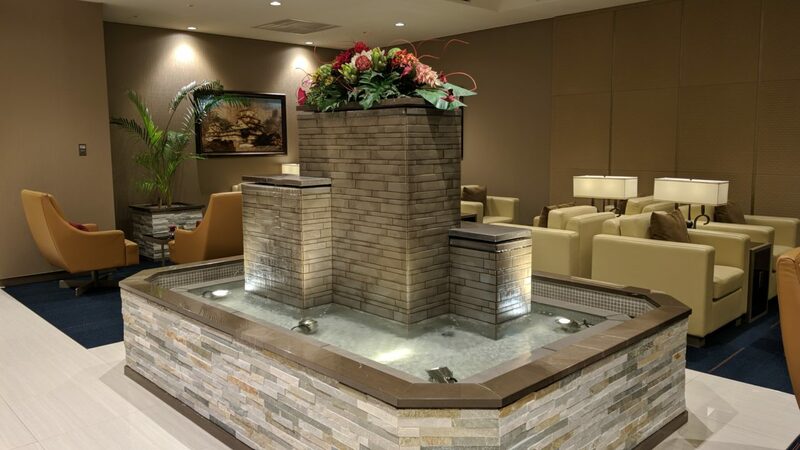 The Iridium Spa feels modern and luxurious. Our private treatment cabana at the beach. 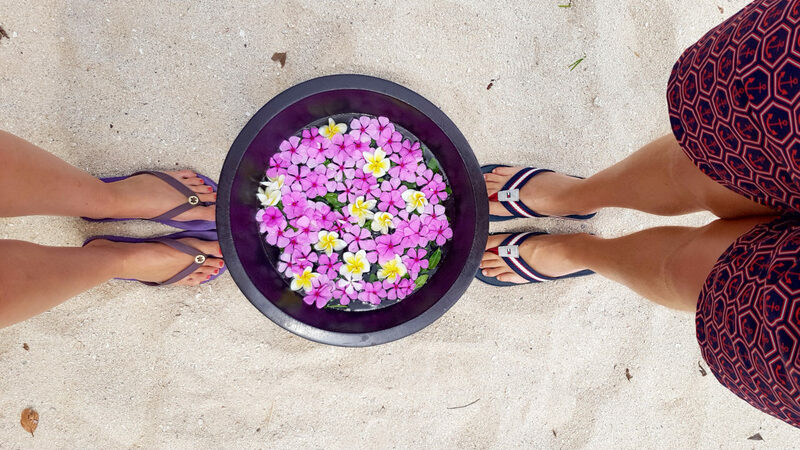 Happy feet after our couples treatment at the beach. 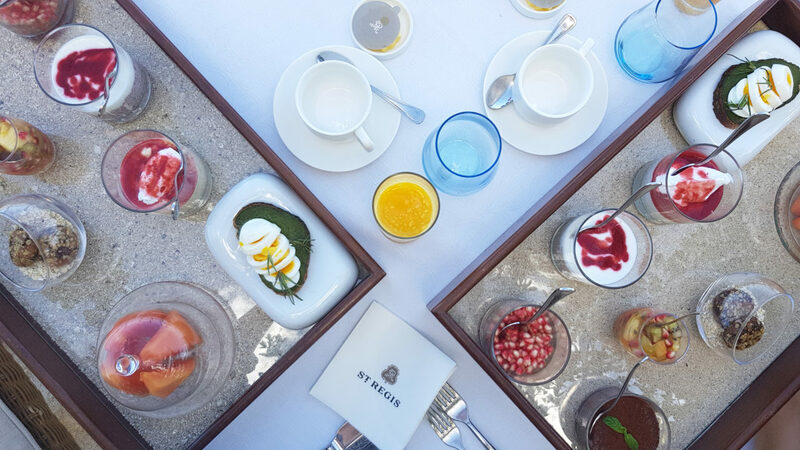 An extraordinary breakfast experiemce after our treatment. 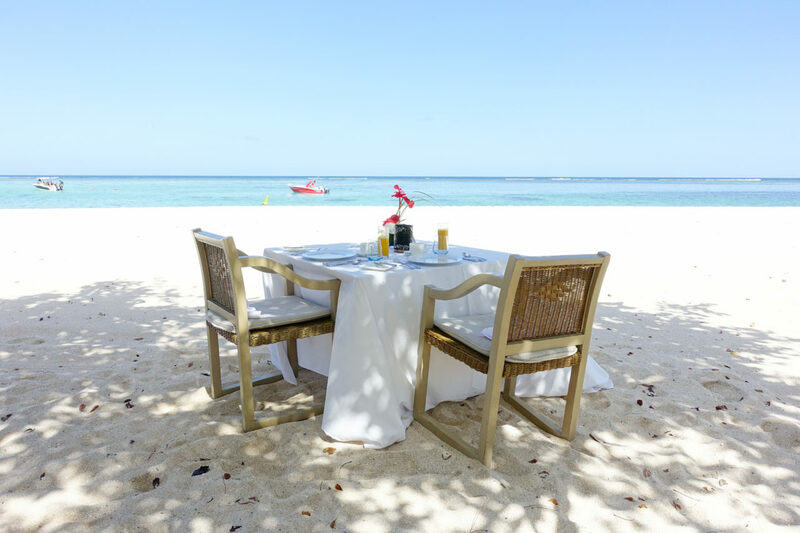 Our private table at the beach – what a way to start the day. 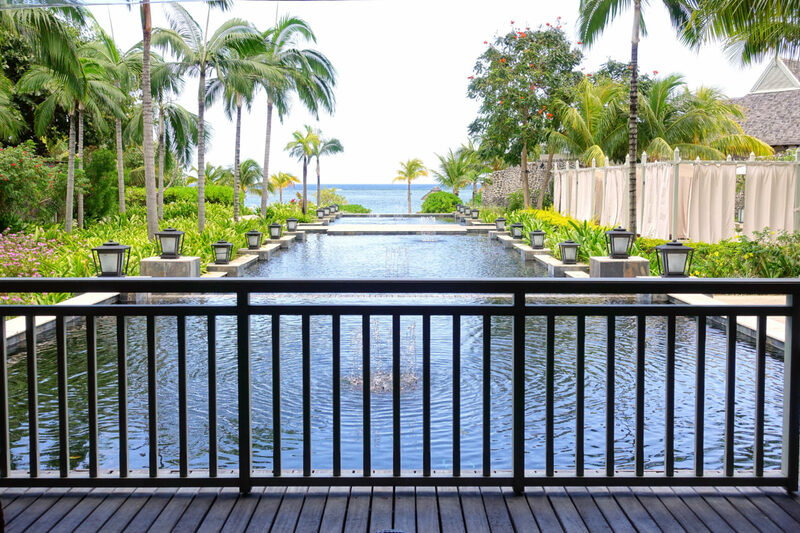 The St. Regis Mauritius Resort is not just a recommendation – it’s a must when visiting the island. 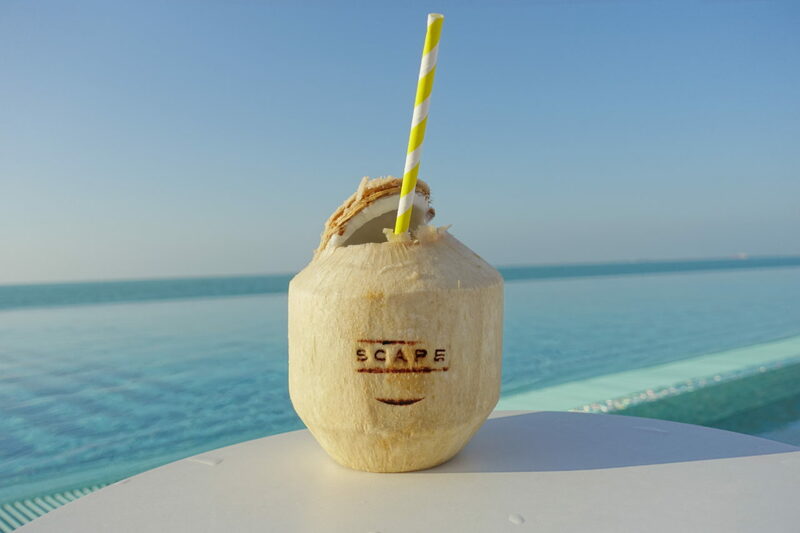 I can highly recommend the resort if you are looking for a truly relaxing holiday and great food options as well as extraordinary service are important to you. If you enjoy watersports and a remote and beautiful location you can’t go wrong with this resort. 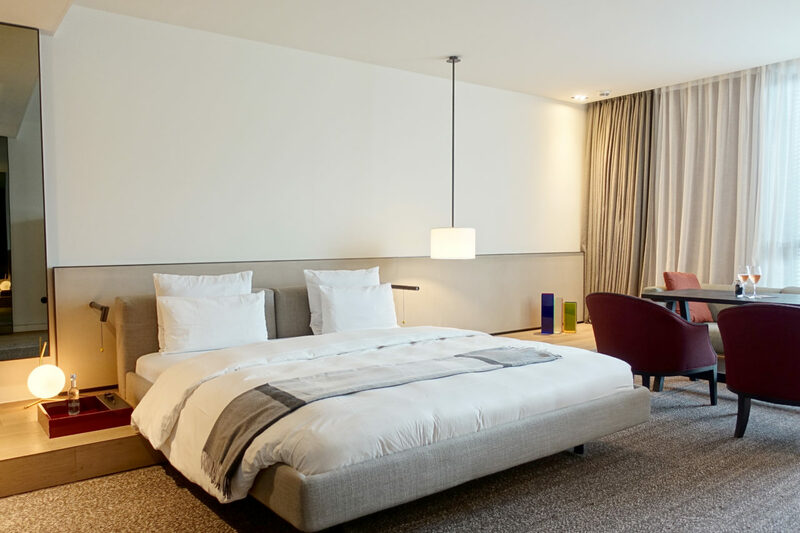 Be prepared that it comes with a price tag and make sure to mention your SPG membership while booking to make sure to get that extra bit of attention. After our visit we are more sure than ever that we will come back. A definite Passport & Palmtree favourite! Have you been to Mauritius? What is your favourite resort? Hi there! Thanks so much for this helpful post. We are eager to go to this property for our honeymoon. I see you recommended the full-board experience, were you able to dine at all restaurants with this and enjoy wine/spirits? Your thoughts would be greatly appreciated as your reviews of the restaurants sound excellent and we want to make sure we’d get to take full advantage. Thank you! thanks for reaching out! The full-bord will allow you have dinner at all restaurants (except the Japanese restaurant where you will be granted a small discount). Lunch is only served at The Boathouse, as all other restaurants are only open in the evening. Drinks are not part of the meal plan, which is usually the case as it is not an all-inclusive fee. 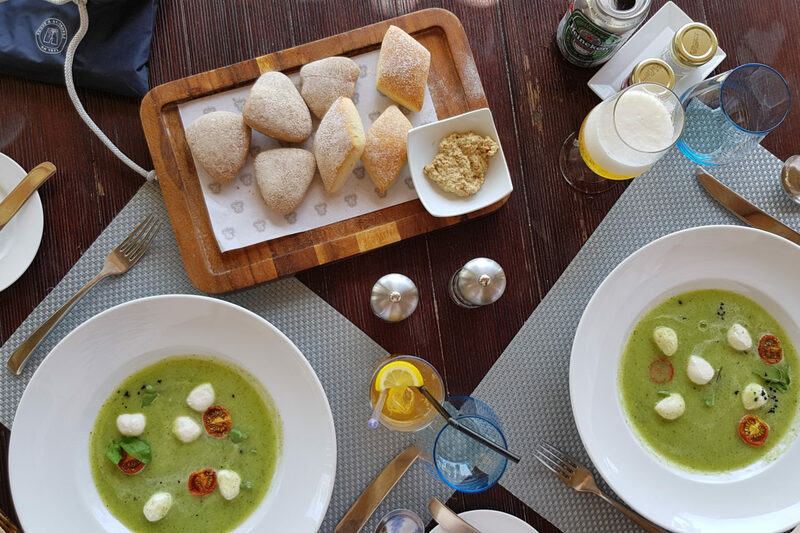 The food in all restaurants is amazing and there are not a lot of dining options close-by, why I would definitely recommend to book at least the half-board option.